BJP calls for abrogation of Article 370 and Article 35 A in Jammu and Kashmir, says will ensure more defence production under Make in India. New Delhi: The BJP manifesto has only added to the perception that its Lok Sabha election campaign will primarily revolve around the theme of nationalism. The party launched its manifesto Monday, promising “zero tolerance” of terrorism, calling for the abrogation of Article 370 and Article 35 A — two highly sensitive issues concerning strife-torn Jammu and Kashmir — and counting the 2016 surgical strikes and the Balakot air strikes as examples of its security doctrine. The manifesto also states that the armed forces will continue to have a “free hand” to challenge any threats. It has reasoned that in order to achieve India’s long-term goals, “we must first secure our country against internal and external aggression”. Prime Minister Narendra Modi, who was among a host of top BJP leaders at the launch of the manifesto, said the party was guided by nationalist principles. 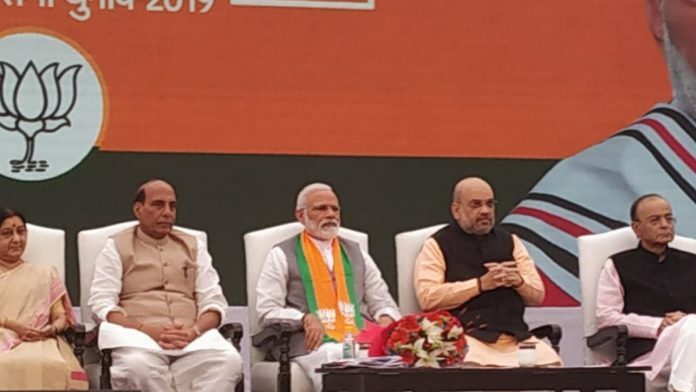 In his note, party president Amit Shah counted “surgical strike, air strike” as the many decisions taken by Prime Minister Narendra Modi that he termed were “historic and has ushered in a comprehensive and fundamental transformation” in the country. Our security doctrine will be guided by our national security interest only, the BJP said adding that this is exemplified by the surgical strikes and the air strikes carried out recently. In 2016, following the Uri terror attack, a special forces team of the Indian Army had carried out a surgical strike in Pakistan occupied Kashmir targeting terror launch pads there. In February this year, the Indian Air Force carried out air raids in Pakistan targeting one of the main terror training centres of Jaish-e-Mohammed in Khyber Pakhtunkhwa’s Balakot. “We will firmly continue our policy of ‘Zero Tolerance’ against terrorism and extremism and will continue to follow our policy of giving a free hand to our security,” the BJP said. The BJP said it will speed up the purchases of outstanding defence-related equipment and weapons. “In order to equip the armed forces with modern equipment, we will continue to take focused steps to strengthen the strike capability of the armed forces,” the manifesto says. The BJP counted the recent India-Russia joint venture for manufacturing AK-203 automatic rifles at Amethi in Uttar Pradesh as one of its achievements. While the BJP has spoken about Make in India in defence, the government does not have to show much when it comes to indigenous defence manufacturing. Some of the mega Make in India projects such as the ones for fighter aircraft, helicopters and submarines are yet to see the light of day. The BJP has claimed that in the last five years, the Modi government has made all necessary efforts to ensure peace in Jammu and Kashmir through decisive action and a firm policy. It added that the party is committed to annulling Article 35A of the Constitution of India as the provision is “discriminatory against non-permanent residents and women of Jammu and Kashmir”. “We believe that Article 35A is an obstacle in the development of the state. We will take all steps to ensure a safe and peaceful environment for all residents of the state,” it said. The party also promised to ensure the safe return of Kashmiri Pandits. “We will provide financial assistance for the resettlement of refugees from West Pakistan, Pakistan occupied Jammu and Kashmir (POJK) and Chhamb,” the party said. Parts of Chhamb were captured by Pakistan during the 1965 and 1971 wars.